郭松, 孙文彦, 顾日良, 王章奎, 陈范骏, 赵秉强, 袁力行, 米国华. 两个玉米品种灌浆期叶片氮转移效率差异的分子机制[J]. 植物营养与肥料学报, 2018, 24(5): 1149-1157. GUO Song, SUN Wen-yan, GU Ri-liang, WANG Zhang-kui, CHEN Fan-jun, ZHAO Bing-qiang, YUAN Li-xing, MI Guo-hua. 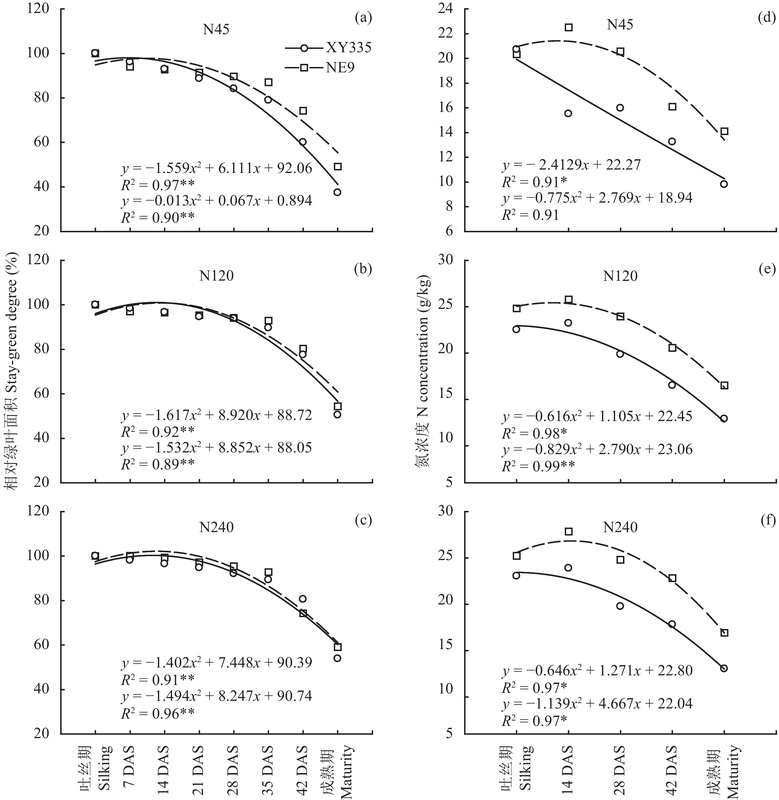 Differences in leaf nitrogen remobilization efficiency and related gene expression during grain filling stage of two maize hybrids[J]. Journal of Plant Nutrition and Fertilizers, 2018, 24(5): 1149-1157. 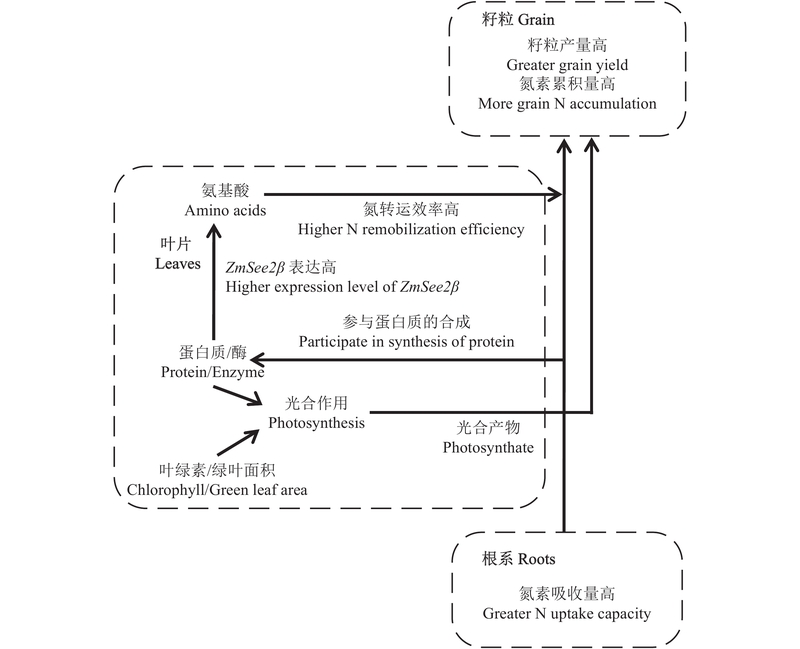 Abstract: 【Objectives】 Improving nitrogen (N) use efficiency of maize (Zea mays L.) is important for high-yielding and nutrient-efficient agriculture. The senescence of leaves after flowering stage is closely relevant to efficient N remobilization. The paper studied thus the molecular mechanism underlying genotypic difference in N remobilization efficiency of maize in field conditions. 【Methods】 In the field experiment, maize cultivars of XY335 (mediate stay-green) and the stay-green hybrid NE9 were used as tested materials, and three application levels of N 45, 120 and 240 kg/hm2 (named N45, N120, N240) were setup. 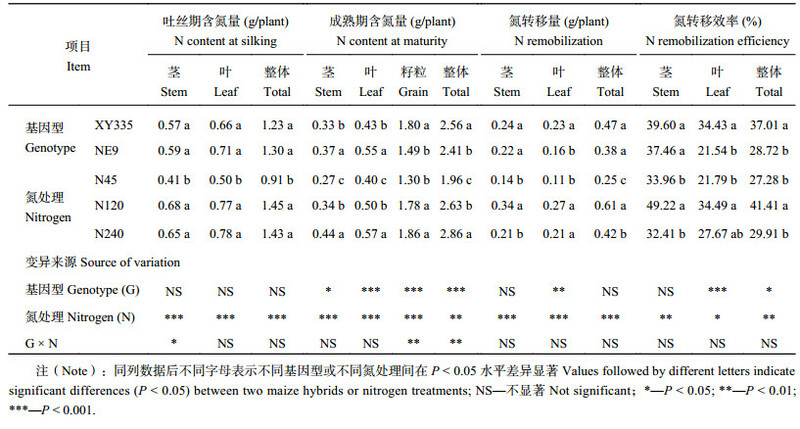 We compared N accumulation of maize at silking and maturity, the dynamic changes of leaf area (at the silking stage, 7, 14, 28, 35 and 42 days after silking, and at the physiological maturity stage) and leaf nitrogen concentration (at the silking stage, 14, 28, and 42 days after silking, and at the physiological maturity stage) from silking to maturity, the SPAD value, the soluble protein concentration, the free amino acid concentration and the expression of genes associated with the N remobilization process. 【Results】 Grain yields of XY335 were greater than those of NE9 under all N levels. N concentrations were increased with the increase of N application level in grains, but that was similar in the N120 and N240 treatments in stems. No significant difference was observed in harvest index (HI) between the two genotypes. XY335 showed higher NHI than NE9, and higher N remobilization efficiency (increased by 8.28 percentage points), which can be mainly explained by the NRE from the leaf rather than the stem (increased by 12.89 percentage points, P < 0.05). The onset of N decrease in leaves was earlier in XY335 than in NE9, and even worse under low N application level (N45), suggesting that early N export from the source leaves occurred. At maturity, leaf N concentrations of XY335 were lower than those of NE9. From silking to 28 DAS (days after silking), the reduction of leaf soluble protein concentration of XY335 was more rapidly than that of NE9, the reduction rate was 16.5 and 6.2 percentage points higher under the N 45 and N120 treatments respectively. The concentration of total free amino acids was increased from silking to 28 DAS across genotypes and N treatments, and the increment of the acids of XY335 was greater than that of NE9 under the N45 and N120 treatments. ZmSee2β expression was decreased with increasing of N supply at both sampling stages in both hybrids, and its expression was increased from silking to 28 DAS in each genotypes. Correspondingly the expression level of ZmSee2β was higher in XY335 than that of NE9, which suggested protein degradation was more rapid in XY335. 【Conclusions】 Compared with stay-green NE9, XY335 has characteristics of greater grain yield and high grain nitrogen accumulation. This is not only due to the greater nitrogen uptake capacity of XY335 after silking, but also the higher nitrogen remobilization efficiency in the leaves. The genotypic difference in leaf N remobilization efficiency is related to the degradation of soluble proteins regulated by the expression of ZmSee2β. 注（Note）: 1) 序列号引自www.ncbi.nlm.nih.gov。GenBank accession number was referred to www.ncbi.nlm.nih.gov. 注（Note）：同行数据后不同字母表示两个基因型在 P < 0.05 水平下差异显著 Values followed by different letters in a row indicate significant differences between two maize hybrids at P < 0.05 level. 注（Note）：同列数据后不同字母表示不同基因型或不同氮处理间在 P < 0.05 水平差异显著 Values followed by different letters indicate significant differences ( P < 0.05) between two maize hybrids or nitrogen treatments; NS—不显著 Not significant；*— P < 0.05; **— P < 0.01; ***— P < 0.001. Gallais A, Coque M. Genetic variation and selection for nitrogen use efficiency in maize: A synthesis[J]. Maydica, 2005, 50(3–4): 531–547. 米国华, 陈范骏, 张福锁. 作物养分高效的生理基础与遗传改良[M]. 北京: 中国农业大学出版社, 2012. Mi G H, Chen F J, Zhang F S. Physiological basis and genetic improvement of nutrient use efficiency in crop [M]. Beijing: China Agricultural University Press, 2012. Mae T, Thomas H, Gay A P, et al. Leaf development in lolium temulentum: Photosynthesis and photosynthetic proteins in leaves senescing under different irradiances[J]. Plant and Cell Physiology, 1993, 34(3): 391–399. Moore S. Amino acid analysis: aqueous dimethyl sulfoxide as solvent for ninhydrin reaction[J]. Journal of Biological Chemistry, 1968, 243: 6281–6283. 米国华, 陈范骏, 春亮, 等. 玉米氮高效品种的生物学特征[J]. 植物营养与肥料学报, 2007, 13(1): 155–159. 米国华. 论作物养分效率及其遗传改良[J]. 植物营养与肥料学报, 2017, 23(6): 1525–1535. Mi G H. Nutrient use efficiency in crops and its genetic improvement[J]. Journal of Plant Nutrition and Fertilizer, 2017, 23(6): 1525–1535. 春亮, 陈范骏, 张福锁, 等. 不同氮效率玉米杂交种的根系生长、氮素吸收与产量形成[J]. 植物营养与肥料学报, 2005, 11(5): 615–619. Masclaux-Daubresse C, Reisdorf-Cren M, Orsel M. Leaf nitrogen remobilisation for plant development and grain filling[J]. Plant Biology, 2008, 10(Suppl. 1): 23–26. Kumudini S. Trials and tribulations: a review of the role of assimilate supply in soybean genetic yield improvement[J]. Field Crops Research, 2002, 75(2–3): 211–222. Mu X H, Chen Q W, Chen F J, et al. Within-leaf nitrogen allocation in adaptation to low nitrogen supply in maize during grain-filling stage[J]. Frontiers in Plant Science, 2016, 7: 699.